Sometimes, we just want to get to Jesus. Recently, Christianity Today ran an article Under Discussion on the question of whether it is good or not for Christians to read through the Bible in one year. All the contributors were passionate about people knowing and understanding the Bible. Everyone wants people to have a deeper engagement with scripture. Yet, I found myself wrestling with one comment. Most people never get past February; they hit Leviticus and give up. To be fair, I’m taking her out of context. The full quote shows her desire to have people not just know scripture, but apply it. But her point stands. Most of us who have ever tried to read straight through the Bible find ourselves lagging when we get to Leviticus. Our eyes glaze over at the lists in Numbers or we find ourselves steadily more confused as we get deeper into the various kings of Israel and Judah. Sometimes, we just want to skip over all of it and go straight to the New Testament. We want to hear about Jesus. After all, isn’t the story about him anyway? Why not slide past the introduction and go right to the climax? It’s not that we are lazy, we simply don’t know what to do with the Old Testament. How do I read it? What is God even saying in this story? In this list? In this law? And in our confusion, it remains unread and we lose something. I want to make a case for reading the Old Testament. Psalm 1 says that those “whose delight is in the Law of the Lord” are blessed. We need these books in our Bible. They are more than simply the introduction to the ‘main thing,’ they are God’s Word. The same God who spoke on Sinai spoke the Sermon on the Mount. The same God who descended on the temple descended at Pentecost. Scripture finds its center in Jesus Christ, but all of it is the Word of God for the people of God (to borrow the title of an excellent book). So for the next three weeks, I will be exploring three different reasons for Christians to be committed to reading the Old Testament. 1. Through the Old Testament, God helps us see ourselves for who we are and leads us to Christ. 2. The Old Testament was the Bible that Jesus read, loved, and prayed. 3. Through the Old Testament, God helps his redeemed people know how to live in his kingdom. I was fairly straight-laced in high school. No drugs, no alcohol, just baggy pants and a hooded sweatshirt. Nothing too crazy. I did class up for a while with my ‘polo shirt phase’ during junior year. But when graduation came and graduation party season commenced, I wanted to do something a little different. In case you come from a land that doesn’t experience the joy of graduation parties, here’s how it works. After graduation, everyone’s parents throws a party in honor of their graduate and invite their friends, family, and family friends to come. Usually, people give you money to help support you as you head off the college. The parties were usually on the weekends, so on a given saturday in June, I usually had at least four party invitations. On one saturday in June 2010, I decided to dress up. I dyed my hair black and slicked it up into a faux-hawk. 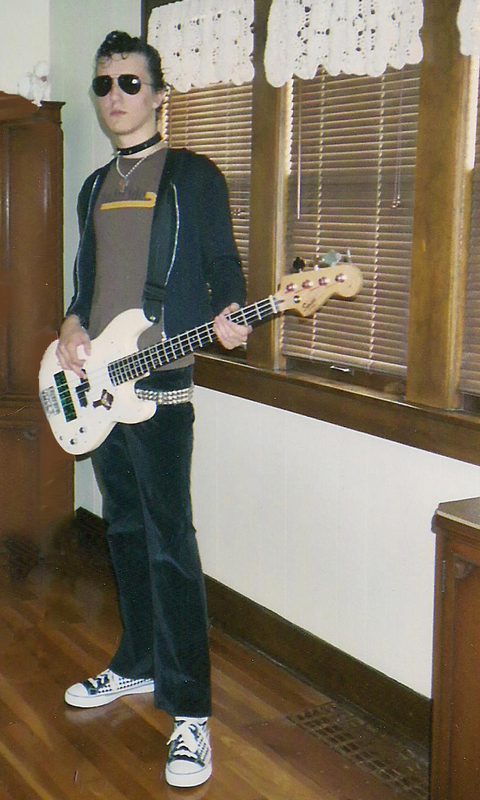 I put on some velvet girls’ skinny jeans, an extremely small band shirt, studded collar, and aviator sunglasses (see the picture below for me in all my glory). Punk Rock Pastor. Photo by Terri Wing. In this amazing attire, I started going to graduation parties. The clothes were uncomfortable, but it was well worth it. The reactions were great – shock, confusion, etc. Most people didn’t even recognize me at first – I was almost kicked out of one party before I made it in the door. But as the shock wore off, something else happened. I forgot how I was dressed and what I looked like. I started carrying on normal conversations, completely oblivious to how I looked. After the shock and discomfort wore off, I forgot what I truly looked like. I continued on as if everything was normal. My friend’s blunt statement caused me to step back and take a second look at myself. I needed to look at the man in the mirror. I don’t think there is anything wrong with how I dressed, but I was surprised at how easily I forgot what I looked like and tried to continue life as usual. I doubt my experience at the graduation parties was unique. Maybe only a few of us will dress up and forget our appearance, but we all forget what we truly look like. If not physically, then spiritually. When we first take a step away from God or find ourselves falling into sinful habits, we usually notice. But once the shock wears off, we can easily forget just how we look, and try to pass off everything as normal. We walk along as if everything is good, when it isn’t. We forget what we look like. We need a mirror to show us just how we look. A man with spots on his face might happily go about in public, unaware that he has spots. But if someone shows him a mirror, he feels ashamed and tries to hide himself. We were spotted like that, and heaven and earth were both ashamed of us, but we nevertheless went about our business without paying attention to that because we did not know what sin was and hypocrisy had blinded our eyes so that we could not see the curse that was on us. The law, however, makes sin plain – this is what you look like when you are under the penalty of the curse. God’s word holds up a mirror so that we can see ourselves truly and so that, as Olevianus goes on to say, we can ‘come to Christ in humility.’ It is easy to go through life unaware of the spots on our faces, just as it was easy for me to forget I was wearing my punk outfit. God’s Word is a mirror in which we can see ourselves for who we are. We see who God made us to be and see our own lives east of Eden. Without the mirror, the spotted man will go about his business as if nothing is wrong. Without knowing the law, we too may go about life not knowing how we truly look. We need the Old Testament because it is more than a set of old stories, old rules, and old lists. It is our mirror. Theologians at the time of the Reformation called this the First Use of the Law. God’s Law helps us be honest about ourselves and where we stand before God and then leads us to Christ. One of the reasons we need the Old Testament is so we can see our sin clearly and recognize our need for a savior. While most of what I have been saying about the Law as a mirror seems negative, its ultimate purpose is positive. The Old Testament leads us to Jesus Christ. As we study and understand the Law, the Prophets, and the Writings, we begin to see our need for Jesus’ righteousness. We also see the way he is already anticipated in the Old Testament. Reading the Old Testament as a mirror to our lives leads us only deeper into the arms of Jesus. I have thought of the phrase “The Man In The Mirror” many times in my life. There’s a song by Dan Fogelberg with the same title that has spoken to me many times…the man in the mirror, he keeps getting nearer, but I am not moving…also “those voices you’re hearing are never worth fearing, they’re only inside you.” I also think of the line in City Slickers where one of Billy Crystal’s friends presents a hypothetical situation where Billy could cheat on his wife and she would never know. He replies that he would still have to look in the mirror and know what he did. Obviously, I have had some challenges during my life with looking in the mirror. It feels pretty good most of the time now. I told you about the Argentinian writer, Jorge Luis Borges, whose essays and short fiction I have been reading lately. One of his short essays is about the phrase where Paul talks about seeing through a glass darkly (based on the translation). 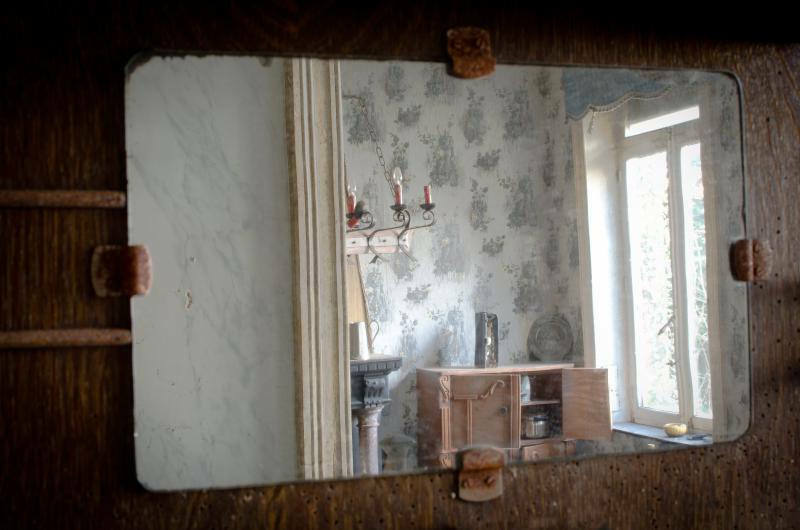 Borges notes that one of the translations of that phrase suggests that the dark glass is really a mirror, and that we are called not to look at others, but to look at ourselves, and that it will never be easy, and seldom clear. He refers to it as “the mirror of enigmas.” I believe he makes reference to a theologian named Leon Ploy. Don’t have the book in front of me. All that said, it is powerful imagery, and a pretty humbling approach to life, but a good one, I think.